“The body is both a temple and a perfect machine. Our bodies have within them a healing potential, and we nourish this potential with the pure and simple foods found in nature”, Angela Lindvall. Healthy eating does not have to be monotonous. There is a smorgasbord of food to experiment with in the kitchen to create healthy sweet treats. Staples in the my kitchen for sweet treats consist of desiccated coconut, ground almonds, goji berries, raisins, dates, cacao nibs and powder, different types of raw nuts and rice syrup. 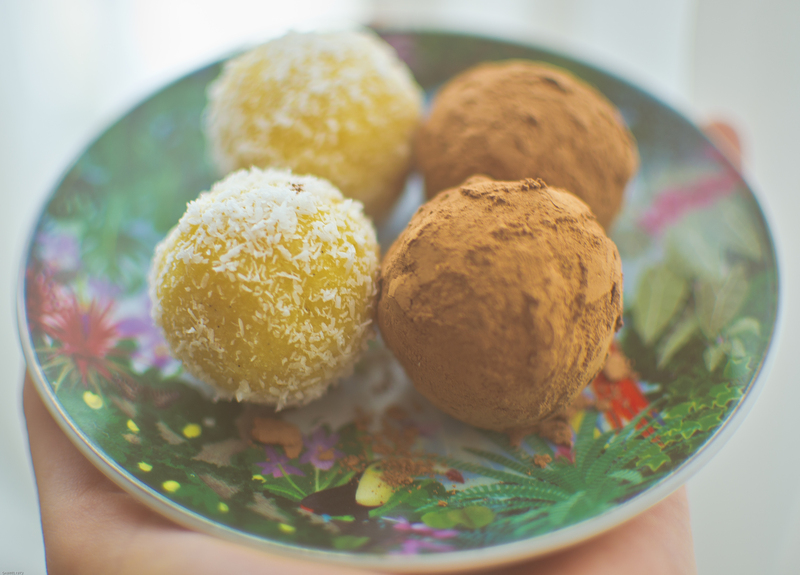 Today I made “Coconut & Almond Bliss Balls infused with Cashew Saffron Mlyk”. I could have left out the word “infused” but I thought it sounded more grand. I recently came across Essentially. Essentially is a raw juice company based in Dubai. They produce the Cashew Saffron Mlyk its contains cashew, water, agave nectar, coconut butter, vanilla, cardamom, cinnamon and sea salt. We are in the middle of Ramadan in Abu Dhabi and these bliss balls would be a great Iftar treat as they have great Arabian flavours. Food Processor: add desiccated coconut, coconut flour, ground almonds, vanilla and blitz. Combine rice syrup and cashew saffron – blitz until paste formed. Scoop: use a tablespoon measurement to scoop out the mixture and roll into delicious Bliss Balls. In two separate bowls add desiccated coconut and raw cocoa powder. Roll the individual balls in the mixture to cover evenly (as you can see from the supporting photographic image). Pop in the fridge for 25 minutes before serving.